Athos came in fourth place in Class C which was won by SilencioImage courtesy of Claire Matches. The first full day of racing at the 22nd Superyacht Cup in Palma kicked off on Thursday with the entire 16-strong superyacht fleet taking to the water. Race organisers implemented the ORCsy handicapping system to smooth out differences in size and design to provide an even playing field. 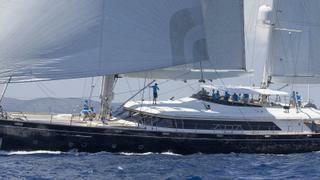 Hoping to repeat her Superyacht Cup victory in 2016, Class A competitor Win Win was first over the line in the Pantaenius Race as part of a staggered starting sequence. As Win Win headed out on the left-hand side of the course, the rest of the superyacht followed suit, starting at two-minute intervals in a light but steady breeze. Class A rivals Saudade opted for the right side to the first windward mark while Highland FlingXV followed in Win Win’s wake. 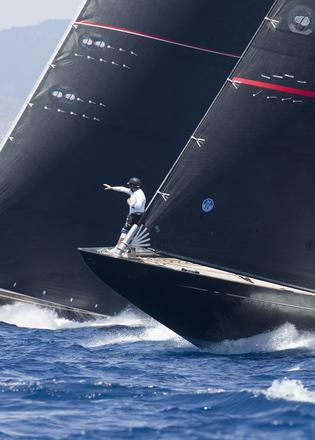 In her Superyacht Cup debut, Highland Fling XV demonstrated her racing pedigree and won by almost a minute and half on corrected time after two and a half hours of racing. Saudade was pushed into second place while Win Win was unable to reprise last year’s class victory and came in third, 23 seconds behind Saudade. As Class B got underway, the largest class at the regatta with seven competitors, J Class rivals Velsheda and Svea started together in the staggered sequence. After yesterday’s J Class exhibition race, in which Velsheda and Svea took a win apiece, the pair looked to maintain their race-within-a-race wrangle. However, Velsheda not only got the better of Svea, but celebrated a Class B victory ahead of Mari-Cha IIIwhich was pushed into second place by a difference of over five minutes. 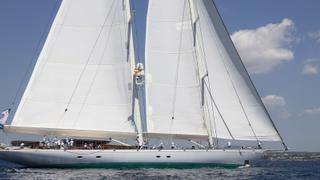 Svea came third, just 28 seconds behind the 45 metre ketch on corrected time. Velsheda tactician Tom Dodson said “taking the right-hand side of the first beat” was a key factor in the team’s success. “We weren’t a 100 per cent sure about it but we were pretty sure that side would work out, and then we saw a couple of the locals going that way, so we felt pretty good about that,” he said. “I don’t expect any more races like that to be honest, our performances with Svea are pretty much identical." Class C was the most closely contested race of the day with Silencio beating Bolero by just 12 seconds and Aquarius in third. Silencio helm Ed Danby said the team had incorrectly predicted Silencio had lost out to Bolero by 15 seconds. “We had a cracking last run coming in and got two really favourable shifts which helped a lot,” he said. Meanwhile Class D was a two-horse race between the Corinthian duo Scorpione of London and Q. Scorpione clinched first place, a minute and a half ahead of Q. After the day’s racing, competitors relaxed at the North Sails Happy Hour and Paella Dock Party at Jack’s Club by St Regis. 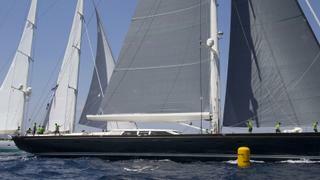 The Superyacht Cup concludes on June 23.